Demonstrators protest at the South Carolina Statehouse June 27, 2015, in Columbia, S.C., calling for the Confederate flag to remain on Statehouse grounds. Just hours after a Black Lives Matter activist scaled a pole outside the South Carolina Statehouse to remove the Confederate flag, dozens of supporters rallied in defense of the divisive banner Saturday at the capitol in Columbia, S.C., according to USA Today. A new flag was hoisted within an hour after Black Lives Matter activist Bree Newsome removed it at the break of dawn. The rally was not held in response to the incident, having been planned since late last week amid calls to #takeitdown, notes the news outlet. The renewed calls to remove the flag, long a symbol of slavery and oppression in America, came after nine people were assassinated over a week ago at Emanuel African Methodist Episcopal Church in Charleston, S.C., allegedly by a self-professed Confederate-flag-waving racist. After the shootings, South Carolina GOP Gov. Nikki Haley expressed support for removing the flag from the Statehouse grounds. But supporters such as Ryan Hughes told the news oulet that they believe a majority of people in the state want the flag to remain at the Capitol. To #takeitdown, they argue, would go against the will of the people. "They need a history lesson," Hughes told USA Today. 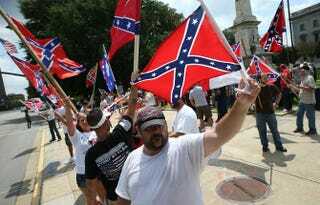 "They need to go back and look at what this flag really stands for, and that is states rights. That's freedom from tyranny. That's freedom from subjugation from the federal government." Meanwhile, in real life, President Barack Obama called the flag a "reminder of systemic oppression and racial subjugation" while delivering the eulogy in Charleston Friday for the Rev. Clementa Pinckney, who was killed in the racist attack. "Removing the flag from this state's Capitol would not be an act of political correctness,” Obama said. "It would not be an insult to the valor of Confederate soldiers. It would simply be an acknowledgment for the cause for which they fought, for slavery, is wrong."